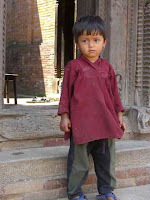 It is torturous pushing through the filthy, garbage-strewn streets of Kathmandu. It takes away any thought of exoticism. There is no garbage pickup. There is poor sewerage. There is so much pollution that many people put hospital masks on their faces, especially police. Worse, there are no seat belts in the fearless cars meeting each other head on or pushing another to the side while horns sound like non-stop rap music. People do not get out of the way but expect you to see them since you certainly cannot hear them in the city shouts. The mornings are cool and the days hot. And there is much tension in the air as restrictions take position in this city investing today in a democratic election. (There seems to be a plethora of elections all over the world.) The stories behind the Nepali elections as the nation se eks a solution to the tremendous gap between the royal family and all the rest of the people are complicated by a violent history. But the people are tough. Men and women swarm into streets and squares going about their business, or stand in open doors of shops edging the street smoking, rearranging their scarves, and just plain musing. Flags hang from windows of Maoist supporters and yesterday, as I visited a Hindu center, phalanx of police in blue camouflage uniforms, bullet proof vests, and carrying rifles were deposited there for the day and a supposed celebration of chariots last night, which usually erupts into brawls between political parties. No alcohol allowed 24 hours prior to elections, except in tourist hotels. Police captains armed with long bamboo poles passed through picturesque and narrow streets (only foot traffic and intrusive motorcycles allowed) knocking flags off high windows. The government had issued a moratorium on flag-hanging. No flags 24 hours before the election. Most had not taken them down. Jim my guide and I took a brisk 7 a.m. walk Wednesday when streets were less filled with movers and shakers to try a patio breakfast at Mike’s Cafe. Mike is a former American Peace Corps participant who settled in Kathmandu and opened this place specializing in American-styled breakfasts (including muffins, pancakes, even huevos rancheros).. Bread is not something served with most meals outside of touristic hotels so it was a welcome. 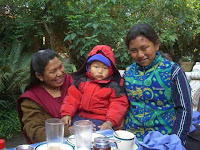 A Sherpa lad y and her daughter and two year old son met us to receive some goodies Jim had brought them from the states. Although typically the mother had never been educated, could not read or write, she was well abreast of the history of her country and the current turmoil. She explained to me that marriages are arranged by parents, but that when a child reached about 17 or 18, dating was allowed. She implied that although women are making advances in the business and political fields, in general, and in the country, they rarely leave their tribal districts as they work to feed and take care of their families, in the fields, in the homes and kitchens, and in lots of livestock. There is no interest in fitness, gyms, marathon or any kind of running, and most are not hikers, although her teenage daughter plays sports in school, and women play British cricket in Nepal.There is interest in fashion and dressing stylishly. Women decorate the otherwise grim citysca pe. We walked through Nag Pokary, a water pool with a pole wrapped with a metal snake. It is a holy place, Jim explained. I asked, Why? He commented, there doesn’t have to be a reason, but this is where the Hindus believe the Nag surfaced, and I guess Nag is one of the many animals the Hindus worship. All around the top of the pool were stationed covered benches where people sitting in yoga poses meditated. Other men actually used the perimeter of the pool for a touch of a morning job. 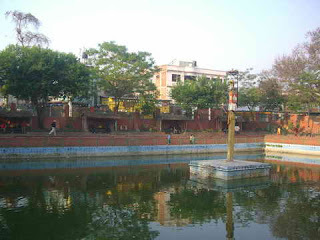 My day trip was to Bactapur, which means City of Devotees, a Hindu city. 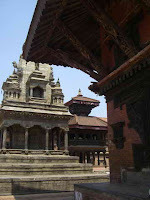 There are four major cities that make up Kathmandu and each is remnant of an ancient kingdom that once had its own kin g. Bactapur had all the flavor of the Hindu religion, including Sadhu or priests in orange and yellow robes, usually dirty, and hiding thin bodies with hands outstretched for rupees. The old city has a charm with its rust brick buildings (there are 30 brick factories in the area) and immaculately carved wooden buildings. Most walls bear wooden screens where those inside can look out but the outsiders cannot see inside. 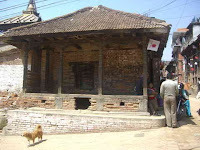 Hindu temples basically are not accessible. The outside is. The inside is not. Supposedly the priests offer gifts a nd prayer on the inside. But the followers don’t wander in and out with the freedom a Buddhist is allowed. They most assuredly must make prayers outside the temple daily. And there are porches provided where men and women might fold up and meditate, or spin thread, or play cards, or just watch whatever is happening in the squares, while getting out of the hot sun. 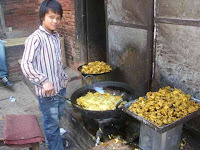 Strolling through Bactapur’s cobbled streets takes one back into history. 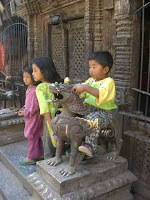 The wooden art work and carvings that adorn the buildings are based on fifteen patterns. 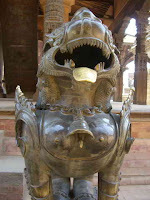 There are tympanums over entrances carved with the same god or goddess that is to be worshiped inside the courtyard. They are called sign boards and remind me of the tympanums over Catholic churches in Europe which warn those who enter that it’s heaven or hell depending on your sin level. T he very narrow streets, although relatively garbage free, are lined with stores of pashmina scarves, Indian saris, rice paper calendars, Mandala art work, wood carvings and every kind of trinket to access the tourist. 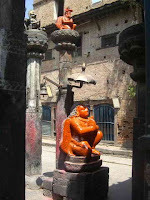 Throughout Bactapur are all sorts of spaces and statues to worship. Mostly the subject matter is in animal form, usually smudged in red powder. Most interesting was the three tiered temples, sort of pagodas, approached by a set of steep stairs on the sides of which are animal forms. 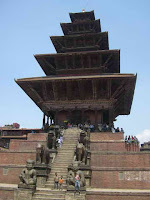 In Durbar Square remains the temple of the goddess of wealth and power. The first pair of figures is the Wrestler of Time which is ten times stronger than you and me; then the elephant, ten times stronger than the Wrestler; then the lion, ten times stronger than the elephant; and the griffin, ten times stronger than the lion, and finally the monkey god and goddess, ten times stronger than the griffin. At the top is the image of the goddess, Siddhilaxmi, who is absolute. You can climb up the steep stairs and sit around the temple but you cannot go in. The extreme differences of the two religion surprised me. Buddhism is hopeful, peaceful, with beautiful and ornate temples where the interior is the most important and the aim is to improve yourself and put away all things of the secular world in order to find peace and simplicity in the soul. The Dalai Lama examples its respectfulness. But Hinduism seems a dark, unhelpful religion with complicated gods and goddesses to satiate needs and prayers, interesting but unaccessible temples and gurus. Gurus, acetics are holy men, and the top holy man, from the 6th century, was Shankaracharya. (Who can pronounce these words? Maybe this is why Hindu Indians speak so rapidly.) ) Gurus were popular during the hippy revolution of the Sixties and Seventies and still is embraced by people hiding out in Asrams. Their logo is take life as it is because you cannot change it or do anything about it as you wait your turn in the next life, wherever and whenever that is. This is why there seems to be abject poverty in Hindu realms. Many controversial and suspect gurus take up yoga poses and give advice to celebrities and whoever wants to find a way to deal with life and really no one leads anyone. As Hindus worship many gods and images, Buddhists worship many forms of the one Buddha and life is a "camino" or street on which you are continually bettering your soul or karma as you seek enlightenment or perfection at the seat of God sitting on the lotus blossom. At least, this is how it seems to me. But what wins my heart in this city no matter where I go are the beautifully countenanced children, curious, playful, content with their fates and not yet tainted by the materialistic world. 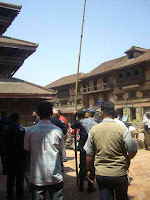 Photos: A Hindu Lion; Downing the flags; Breakfast with a Sherpa family; Nag Pokary; A resting place in Baktapur: All kinds of temples; all kinds of gods to worship; A pagody with power animals; Children who capture your heart.